For several years, architects, designers, and environmentalists have been trumpeting the potential of a building material that has emerged over the past two decades: mass timber. Traditional wood beams are limited by their lack of durability and flammability. But these new varieties of engineered timber products, manufactured by gluing together layers of wood panels, rival steel and concrete in strength, and may actually be more fire resistant. These qualities have opened up the possibility of using wood to build skyscrapers, or “plyscrapers,” and other large-scale developments that would normally require concrete and steel. Advocates say using more of these new timber products could also be beneficial for the Earth. A 2013 study published in the Journal of Sustainable Forestry found the production of construction materials like steel and concrete accounts for 16 percent of global greenhouse gas emissions. The study suggests that manufacturing and shipping wood could reduce construction emissions by as much as 31 percent. The larger construction industry is responsible for nearly 47 percent of all emissions worldwide. Wood is also a renewable resource that sequesters carbon out of the atmosphere as it regrows, and it can potentially be recycled when a building is at the end of its life cycle. That potential is especially important given a trend toward rapid urbanization all over the world, especially in countries like China. One serious area of concern with mass timber is that replacing concrete with wood on any scale could put a strain on existing renewable forests. But in theory, that could incentivize the timber industry to expand and create tens of thousands of new jobs in rural low-income economies. The lightweight material, manufactured specifically for each project so it slots together almost like Lego blocks, also promises to reduce construction times, putting less stress on neighborhoods near developments, which often protest them for their noise and dust. There have been a few dozen mass timber buildings successfully constructed around the world to date, and new plans for ambitious large wooden projects, like a 436-foot tower in Sweden and a 1,148-foot tower in Japan, pop up regularly. But this July, a major project slated to break ground in Portland, Oregon, suddenly went on hold indefinitely, citing market challenges including construction costs. The 12-story development, called Framework, was set to offer a mix of affordable housing and retail, office, and community space, all designed to show off exposed wood. The project served as a guiding light for large-scale plyscrapers in the U.S. In 2014, it won a $1.5 million grant from the federal government, and earned support from a host of environmental and wood groups. Given the relative newness of mass timber, a casual observer could be forgiven for seeing the project’s derailment as a referendum on the building material’s potential in the U.S. The resounding consensus from those who work with mass timber, though, is that Framework’s woes don’t portend anything about the future of mass wood in America. Construction, they point out, will only become more viable in the coming years, as pricey regulatory barriers soften, and domestic mass timber production continues to grow. Framework just suffered, it seems, from trying to do too much, too soon with a new idea. "The Framework project will not cause problems for development of other tall wood buildings," says Timm Locke of the Oregon Forest Resources Institute, a mass timber booster. Outside the U.S., there are plenty of examples of success with the material. The tallest such project standing is Brock Commons, an 18-story, 174-foot student dorm at the University of British Columbia in Vancouver, Canada, which went up two years ago. (That structure still uses a concrete core and is a fairly basic and straightforward design, as opposed to some of the sumptuous and inventive plans wood proselytizers have floated.) Another 18-story development, an apartment complex, is scheduled to open in 2019 in Brummudal, Norway. “Globally,” says Locke, “the U.S. lags behind several other countries” in exploring plyscraper development. Sure, there are some speculative designs floating around for a 62-story tower in Philadelphia or an 80-story tower in Chicago. But most of the hundreds of mass timber projects active in the U.S. are relatively small. Carbon12, an eight-story building in Portland, Oregon, designed by PATH Architecture is currently the tallest mass timber structure in the country. Experts admit that there are challenges to working with mass timber in America. Though these thick wood products are covered in an anti-char coating and don’t ignite easily, based on historical fires and structural constraints of whole beam wood, U.S. building codes limit timber structures —about five or six stories. Teams can get exemptions to these limits, but they lose time, energy, and money proving the safety of their design. Mass timber, acknowledges Locke, is also still more expensive than mainstream materials in the U.S., in part because there are few manufacturers in the country. Sean McTaggart of Hickok Cole, the D.C.-based firm behind a proposed plyscraper for Philadelphia, says his team estimates that mass timber construction currently costs an extra $8 or $9 per square foot compared to steel or concrete. These market challenges are hardly unique to America, though. Most other countries, including Canada (until recently in some provinces), have similar height restrictions in their building codes. Brock Commons project architect Russell Acton says overcoming these restrictions required extra expenses, such as a concrete core, and shielding the building’s exposed wood in three sheets of gypsum for fire safety. Even in Canada’s relatively wood-friendly market, says Acton, encapsulated mass wood buildings come with a 7 percent premium over other material options, like concrete. Costs are also likely to go down in the U.S. and abroad soon. 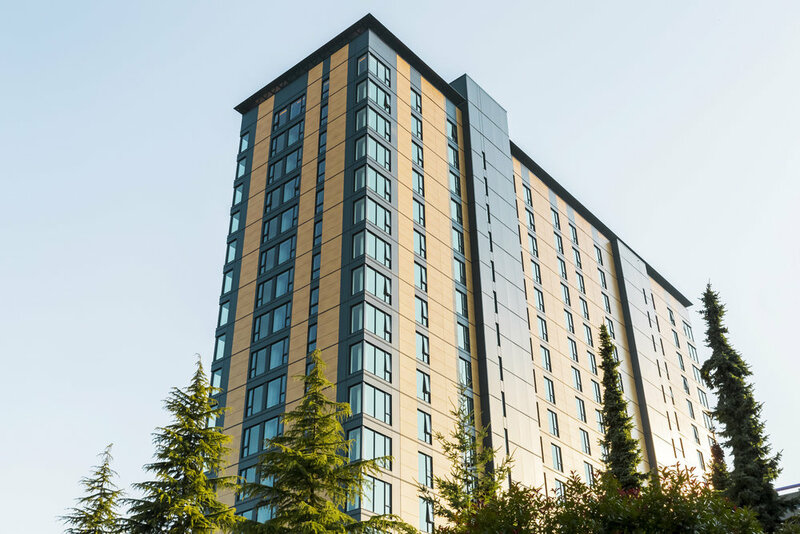 The International Building Code, which U.S. municipalities use as the basis for regional regulations, is on track to update its standards to allow for 18-story mass timber structures across the board, with no lengthy exemption process. Architect Andrew Ruff says the ability to construct taller wood buildings with fewer regulation-related costs will help mass timber become truly economical. Additionally, a number of mass timber manufacturers have also opened in America in the past four years, and growing familiarity in the construction industry should lower prices. Ruff says that concrete prices can be unreliable due to sand shortages, and steel prices will likely be whacky in the future thanks to U.S. President Donald Trump’s unpredictable tariff regimen. That increased cost was a huge problem, especially because the project involved a significant amount of exposed wood, which comes with added fire-safety costs. The team was also trying to use expensive earthquake resistance technology to allow the building to survive seismic activity unscathed, says Locke. On top of that, the project depended on affordable housing tax credits, which Locke notes have lost significant value following the Republican tax reforms of December 2017. “I still think it’s an incredible accomplishment,” says McTaggart, “that this project was brought to permit.” He says Framework’s advancement helped pave the way for other wood buildings to get permits.